The sow was checked in the morning and no signs were noted. By the evening when the sow was checked it was noted that she was producing milk. The young farmers (Katie, Lily and Joe) were called to help with the imminent arrival. 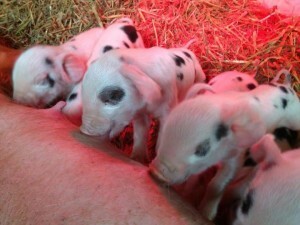 The first piglet arrived about supper time with lots of excitement from the team. The sow needed assistance to deliver 2 of the piglets as she was having difficulty due to them being in the breach position. Our sow gave birth to 11 piglets. Sadly 1 died at birth and the other was crushed during the labour process. The remaining 9 piglets are all thriving and our sow is proving what a fantastic mother she is. For more information about our pigs click here.